If you’ve read my book or subscribed to Becoming a Stepmom or listened to Stepmom Circles for a while, then you’ll know that I prefer to wear rose-colored glasses. I like happy endings. I love being able to turn my own pain into good by using it to help others. I suppose you could say that approach has been a coping method and I suppose that’s true. For me to think that I’m going through pain for no reason! No. Too much for me to bear. So I have a challenge for you this month if you’re willing to accept it: How can you use your pain for good? How can you transform it into something you can help another person with? At some point you have to accept your stepfamily life for all it is and stop fighting it. Know what I mean? It’s so easy to get sucked into the “If only X was different, my life would be happy,” spiral in everyday life. When you add difficult stepchildren, challenging exes, and beleaguered stepparents, it’s enough to spend a lifetime arguing with reality. And certainly, there are things about stepfamily life that do get easier over time. Sometimes the relationship with the ex smooths out after a few years. Sometimes an ex moves away. Sometimes an ex remarries and life does improve significantly. But sometimes none of those things happen and we just continue to fight reality instead of accepting it. And that makes the reality worse. Part of the job of each member of the stepfamily is to learn how to accept the things that come along with stepfamily life that we can’t change. That ex? She’s here to stay. So how can you stop fighting what is and accept it? How can you work with your thoughts so the situation itself doesn’t have as much power to upset you? The fact is, there are things we just have to swallow about life. As most of our parents told as at one time or another, life ain’t fair. So how can you make the most of what you do have? How can you focus your mind on the wonderful areas where you and your family are doing really well? How can you build peace into your daily life? You decided to marry / date / live with a partner who has kids from a previous relationship. That’s reality. He has kids. That’s reality. He has an ex, whether she’s alive or dead. That’s reality. So let’s get on with the business of figuring out how we’re going to live with the reality in the best, most positive and healthy way possible for ourselves and everyone in our families. Ladies: I got this letter a few days ago from a man with four children and I wanted to share it with you. The Mother’s Day tribute from this man to his wife is gorgeous. May we all have spouses that appreciate what we do the way this man does! Happy Mother’s Day! I just read your book over the course of a two-day reading marathon. I couldn’t put it down. I loved it, and I’m not even your target audience. I’m the “biological father” of four kids whose ages range from eight to four. I downloaded your book for my Kindle, and after reading several chapters, I quite promptly ordered a print copy to give to my wife for Mother’s Day this year. I think she’s really going to benefit a lot just from the sheer validation that your book brings by acknowledging everything a stepmom goes through. I benefited from it immensely, because it gave me a much clearer insight into her world, what she’s probably feeling, what she’s probably thinking, and all the rest. I feel a lot more empathy for her, as well as a great deal more gratitude and appreciation for who she is and what she does. I’m including below a short tribute that I wrote for my wife, who (no offense) is the best stepmom in the entire world. But really, it’s a tribute to all stepmoms, and I hope they all get a chance to hear something like this from their husbands. After all, they deserve it. Thanks so much for your contribution. Thank you, first of all, for embracing my children as your own (if not always internally, then at least outwardly, in all that you do for them). This is one of the biggest reasons why I married you in the first place, and it remains one of the biggest reasons why I would marry you all over again any day of the week. I know you have mixed feelings about your success as a stepmom; sometimes you’re able to congratulate yourself and see how much you’ve accomplished, and sometimes you beat yourself up for being impatient or irritable. That makes you normal. I’m their father, and I still waffle between thinking I’m the Best Dad on Earth and thinking I should just surrender all of my parental visitation rights and move to Siberia. If I feel that kind of emotional conflict, you’re bound to feel it even more intensely, and I want you to know that I get that. I still think you’re an awesome stepmom; the best in the world, actually. I want you to know that I acknowledge your right to get frustrated, have the occasional melt-down, and expect me to go the extra mile in helping you make this transition. It’s going to be an ongoing process, it will probably take years, and I don’t expect you to do it alone. I might get impatient with you sometimes because I see you struggling to act in ways that have become second-nature for me, but that’s just because I’ve forgotten (for the moment) how to empathize and see the world through your eyes. When I make myself see things from your vantage point, I get overwhelmed with the magnitude of the challenge you’ve taken on, and then I’m amazed that you’re even still in this marriage, let alone thriving and continuing to be the most incredible wife in the world. You’re not a biological mother. But you sure-as-hell have a right to call yourself a real mother. I’m proud of you. This family of ours loves you, and that’s an accomplishment worth celebrating. I do a lot of work with stepmoms and stepfamilies, but I’m also a freelance writer. A few years ago I met a man while researching another project. His name is Cliff and he has Locked-In Syndrome. When he was in his 40s, Cliff had a brainstem stroke that left him paralyzed and unable to speak. Like the man who wrote The Diving Bell and the Butterfly, Cliff could only communicate by blinking his eyes. After I met Cliff, I ended up working on a book called Climbing the Mountain, which is a collection of writings by stroke and brain injury survivors. Cliff wrote one of the essays. In it, he talks of the many challenges of his situation, but he ends his essay with an upbeat discussion of how much he loves his wife, children, and God. I cry every time I read his story. But it also reminds me that life always grows toward the good. No matter what. When I’m feeling pissy and mopey and rejected and hurt because stepmotherhood is sometimes challenging, I need to remember Cliff’s gift to me: Life always grows toward the good. Thank you, Sir, with all my heart. You’re an inspiration. You’ve made me a better stepmother and person. Stepmoms: When I received training in how to help stepfamilies from the National Stepfamily Resource Center, I got this document in their Smart Steps information for stepfamilies. 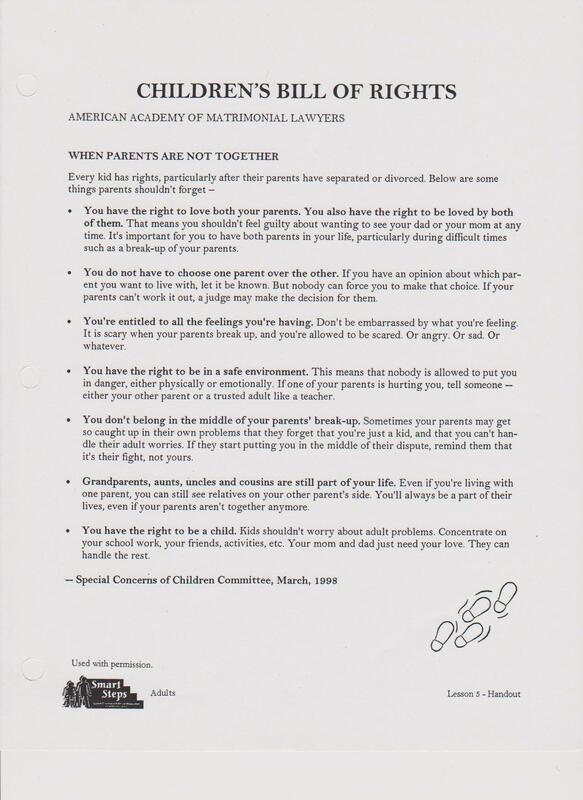 The Children’s Bill of Rights has some wonderful guidelines to help both parents and stepparents talk to the kids about what they’re going through. Good stuff. Most of us have heard the old adage, “Don’t go to bed mad.” And it’s good advice as a general rule of thumb. But just like clothing, one size does not fit all. One couple I spoke with this week has tossed that advice out because it doesn’t work for them. If they’re arguing before bed and they start to get tired, they both know that neither of them will be able to have a rational discussion. To continue discussing the heated topic will only result in a downward spiral of emotional debate that doesn’t get them anywhere. Instead, they say, “I love you honey. I know we’ve got to talk about this some more, but I’m tired and need to go to bed. Let’s finish this tomorrow.” And they really do go to bed and sleep. 1. Relaxed their bodies. Going to sleep allows their cortisol and adrenaline levels to fall back down so their bodies are not in a fight or flight state. That means their brains can actually function better and they see the solutions to problems easier. #2. Reassured each other. By saying “I love you, honey,” they have taken away any threats to the relationship itself. It’s a bonding agent that says, “we’re in this together.” Instead of setting up a power play, it builds camaraderie. The other couple I spoke with this week goes to bed, too. But they feel guilty because they’re “supposed” to be doing what the experts say. I say, you’re the expert. If you know that going to bed calms you down and allows you to have the discussion in a new light in the morning, for heavens sake, go to bed! If, on the other hand, you go to bed and punish your partner with a turned back or stay up all night stewing about it, then you might want to re-think your approach. The important thing is to preserve your relationship so your partnership doesn’t take a hit even if you’re mad. Conflict is just part of the deal in relationships and learning how to deal with in a way that doesn’t harm each other is key. What about you? Have you and your partner come up with ways to deal with conflict that work really well for you? Please share them with the rest of us so we can try them out at home! Yesterday afternoon I watched Oprah. It was a heart-stopping show about three young girls who suffered sexual abuse at the hands of their father and older brothers. At the end of the show Oprah passed along advice to them that she received from one of her mentors. She didn’t mention who it was but it took my breath away so I wanted to share it here. She said, “Forgiveness is letting go of the hope that the past could have been different.” Whoa. It’s not about condoning anyone’s behavior or inviting them back into your life or even wishing them love and peace. Does that resonate or what? Forgiveness is letting go of the hope that the past could have been different. For us stepmothers perhaps one place to focus this powerful thought is on our husbands. (Do you secretly wish he’d never been with another woman or had children with anyone else?) Another place: Our exes. Another place: Our own childhoods. This week I’m meditating on that phrase: Forgiveness is letting go of the hope that the past could have been different. Want to receive news and great content from Becoming A Stepmom in your e-mail? Subscribe to my newsletter! Check the About page to read the Terms of Service for this website.